As the new millennium began, at the bottom of Beech Hill, Headley, hidden behind white metal railings which have themselves seen better days, lay a sad, neglected corner of the parish. Once it was a pond where, according to local residents, fish flourished and kingfishers flew. In 1972 it was drained and in time became an overgrown and unofficial rubbish tip. [See pictures]. The Fuller's Vale Wildlife Pond Association was formed in 2001 to secure restoration of the pond to its original habitat  as a wildlife preserve. By the end of October 2003 it had succeeded in this objective! The pond lies at the top end of Fuller's Vale (B3002), near the junction of Beech Hill, Pond Road and Gentles Lane. 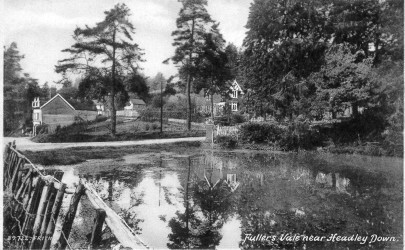 "The Spring and Summer of 1893 were very dry; and up to that time the pond at Chatterton Corner in Fuller's Vale constantly overflowed, the little stream crossing the road and flowing down the north side of Fuller's Vale into the lower pond. Then it ceased to flow for some years (before the shop was built on the North side of the road, and that was at the end of the 19th Century)." By 1904, he tells us, it "constantly overflowed"  but by 1910 it had ceased again. "Sometime before the little stream ceased to flow, a pump had been placed in the east end of the pond, and the stopping may have been due to this. Or it may have been due to the addition of wells that had everywhere been dug. Or the spring may be of the nature of a siphon, and may again flow when the underground reservoir is once more full." In 1914 he records: "For some months the water in the pond has been gradually rising; and now water is flowing from the pond; so that the siphon theory seems to be correct." Then, in 1921: "In the October (1920) magazine, I wrote that it will be interesting to see if, in consequence of last summer's drought, the little stream at Chatterton Corner in Fuller's Vale will cease to flow. It has ceased; and, judging by our last experience, it may not begin to flow again for 20 years." Note in April 2007: From having a brim-full pond with considerable outflow at the end of 2003, the level dropped to about a foot below the weir during 2006 following a dry couple of years (at the end of which we had a hosepipe ban). Despite a wetter than average winter in 2006/07, the level has continued to fall. Is this complying with "Laverty's Hypothesis" above? Subsequent recent notes: Heavy rain at the end of May 2008 filled the pond again for a while from the flow down Pond Road entering via the pipe. It also filled the silt trap. But the level dropped again soon after. Rainy in 2009 and the level rose again  During the cold spell of December 2009/January 2010 the pond froze at a level about 6 inches below the weir. February 2012  Den Hudson once again dredged the pond. The level is still down. January 2014  With all the heavy rains, the pond is full again  but so is the silt trap! As a result, muddy water poured straight into the top of the pond and we now have a fine delta there! December 2016  The pond is full of water, with resident ducks! The pond has been full for some years, but the level has started to go down again in 2018. "My parents came to live at Hillside (the old shop) in Fuller's Vale during March of 1914, when I was 10 months old. I have happy memories of paddling on hot summer days in the cool, constantly running water. "A huge beech tree grew at the far end, on the edge of a field. From the bank below it a spring flowed continuously, keeping the water sparklingly clear. The tree had low, spreading branches on which, as children, we could sit dabbling our feet in the water, while watching the numerous beautiful dragonflies, and occasionally a kingfisher. "Tiny fish also were a joy to watch, and tadpoles to catch in their season. Rushes grew abundantly around the pond's edges, which we made a hobby of plaiting and making into mats and tiny baskets." "Towards the end of the (Second World) War, when Ludshott Common had been stripped of all vegetation by the tanks training there, Pond Road became the catchment area for water draining off the common land, and that caused the pond to overflow and flood really seriously, becoming a positive river flowing rapidly through to Arford. "My parents' shop suffered badly from the flood water-I almost needed a boat to go to All Saints' for my wedding on 28th October 1942-the 'river' had been running for 3 days!" "The 'little stream on the north side of the road' became a strong flood which covered the entire road and rushed over the edge into the gardens of Rose Cottage doing a great deal of damage. This spate of water was too much for the Ar stream, and so Eashing Cottages were frequently flooded during those years." By 1972, plans were unveiled by Alton Rural District Council to improve the drainage in the area, in an attempt to prevent flooding both in Fuller's Vale and also downstream in Arford. This involved laying "48-inch diameter pipes in a ditch running from the junction of Pond Road along Fuller's Vale as far as Rose Cottages" where the outlet directed water back into the valley. Mr Webb, the Consultant Engineer to the Alton Rural District Council, told a local reporter at the time that, "The pipes being laid and the culverts being made have been designed to cope with anything in the way of surface water drainage which may arise in future. The scheme is the result of several years' study by the council into Headley's flooding problem." Unfortunately, by laying the pipes, the Council also drained the pond. It was reported that, "A number of Headley people were angry just before Christmas (1972) when the pond was drained. There were many rumours, including one that it was to be filled in and covered with concrete. This consternation led to a communication with County Councillor Brian Blacker on the subject. He promised to get in touch with the County Surveyor. He did this at the next available meeting and has now received a letter in which the County Surveyor … confirms he will do his best to preserve the pond." History indicates that, while he may have prevented it from being filled with concrete, he did not manage to get it filled again with water. From that time, the bed of the old pond became overgrown with a tangle of vegetation, accumulated rubbish, and became an eyesore. "What is of major concern to me, and must also be to residents in Arford, is that the flows envisaged are nearly 10 times the present maximum under conditions of heavy rain. The AR brook is no more than a large ditch and even under prolonged rain rises to no more than 12/15 inches as much of the water is absorbed by the soft sand sub-soil higher up the valley; the present scheme ensures that one and all will receive a veritable Niagara." In practice, what happened was that in times of heavy rain many of the drains leading into the large pipe were blocked with debris, and there was still considerable flow of water along the surface of Fuller's Vale road. Indeed, Hampshire County Council later had to provide a secondary course for this water to flow under the garden of Rose Cottage, bypassing the large pipe altogether. While not wishing to imply that the 1973 work was of no value in flood control, it can certainly be said that it did not supply a total solution. One effect of the work was that water flowing down Pond Road, which used to be held up by the 'sink' effect of the pond, rushed straight at the pipe entrance carrying its debris with it. As a result, the grille over the entrance blocked quite quickly, and the flow into the pipe from this source was reduced to a fraction of its design capacity. We felt that if the water were allowed to 'settle' a little by flowing through a pond first, combined with a silt trap at the pond's intake, this effect could be reduced. Thus from a practical as well as from an aesthetic point of view, the Association saw that restoration of the pond was a worthwhile project. The Association has now restored the pond to as near its previous state as possible. We believe that the main benefits gained from restoring the pond have been in reintroducing a water wildlife habitat to this part of the parish. We are not proposing it as a recreational facility, and we do not support the provision of car parking, seating or any other works which might encourage 'inappropriate' use of the pond or the area around it. We also believe that, far from creating floods as has been implied in the past, a pond in this location acts as a buffer to help in the control of 'water surges' coming from the direction of Pond Road after sharp storms. The current committee comprises: John Owen Smith (Chairman), Jill Newberry (Hon Secretary), Joe Stansbury (Hon Treasurer), Barbara & Harry North, Mary Kay, Gary Spice, Jeremy Whitaker. We have received approval and support for the project from Headley Parish Council, East Hampshire District Council, Hampshire County Council, Hampshire Wildlife Trust, The River Wey Trust, the Environment Agency, nearby property-owners and numerous members of the public. Our committee meetings have been attended by John Filer (County Councillor), Rita Stubbings (Parish Councillor), Clare Bishop (Hampshire Wildlife Trust), and Adrian Bird (River Wey Trust). The Association is a member of the British Trust for Conservation Volunteers (BTCV). Den Hudson started dredging the site on 22 Sept 2003, and this was largely finished within a fortnight. Work on constructing the outlet weir was completed sufficiently by 16 Oct 2003 for us to allow the pond to start filling naturally. Several springs feed the pond bed, and we were surprised to see that it filled within under 10 days without the help of any rainfall! Water first flowed over the weir at 9pm on 24th October 2003. Low water level (about 18 inches below top of weir) towards the end of July 2006 following months of dry weather, almost topped up again by one day's torrential rain on 13th August  which also filled the silt trap. By the end of April 2007 the dry weather of the previous year seems to have stopped the springs from flowing, and the water level was down to about 30 inches below the top of the weir. See "Laverty's Hypothesis"
Heavy rain at the end of May 2008 filled the pond again for a while from the flow down Pond Road entering via the pipe. It also filled the silt trap. But the level dropped again soon after. PS. The Hampshire Wildlife Trust will assist us in selecting suitable native plants for planting in and around the pond site. PLEASE DON'T PUT ANYTHING ELSE IN THERE YOURSELVES!  What may look pretty in your garden can cause an ecological disaster in a wildlife pond. Thank you. Contact Harry North on 01428 713085 for details of future work parties.